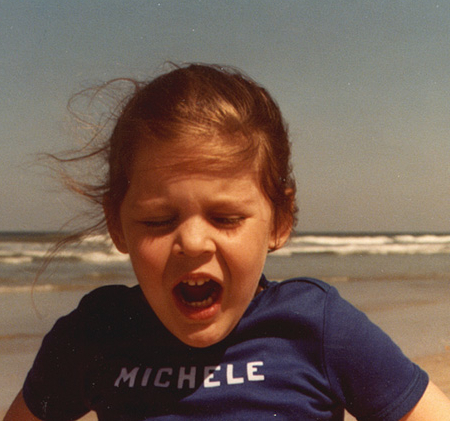 My name is Chel, which is short for “Michele”. I’m 44 years old as of writing this (born in 1974). I was born and raised on Long Island, NY, went to college and grad school in Atlanta (Emory University, studied Art History and Film Studies), and I currently live in Southwest Florida, which I have sort of love/hate relationship with. Eventually we’re planning on moving somewhere with a milder climate, seasons, big leafy trees, and access to a city/town with some great museums, shops, a science museum, etc. But for the next 6 years we’re staying put because my daughter loves her school. I have a husband named Tom (we’ve been together since 2000) and a daughter named Grace (born in 2005, and we adopted her from Vietnam in 2006 – she’s about to turn 13) and a bunch of pets– four rescue cats, two parrots, and a leopard gecko. All but one of our pets are rescues and/or senior animals. I’ve also been a vegetarian since I was 15- I’m quite invested in the issue of animal welfare and things related to humane treatment of animals. I hope by the time I pass from this earth, factory farming has ended and all creatures are treated with care and kindness. As far as “what do you do?”: I sort of had to “retire” several years ago due to health issues- I was born with Spina Bifida, which is kind of serious, but I’m doing pretty good, all things considering. However, when I was in 30’s my doctors made it clear that if I wanted to *continue* to do well and live a long life, I needed to make my health my main priority. I spend about 6-7 hours a day on health-related tasks, some of which I talk about and some of which I don’t. Two hours of that is devoted to working out, usually by distance swimming. Swimming was and is the only “sport” I can take part in because of my health stuff, so when I was 18 years old I started swimming a few laps every day and I eventually worked up to about five miles a day. I’m super regimented about swimming every.single.day. It keeps me healthy *and* sane. When I have free time, I spend it in my art studio. I love being creative. I paint, draw, collage, keep a visual journal, and whatever else floats my boat. I take tons of classes and change mediums often. I’m very shy. Since I was a chatty baby, my family sort of stuck that “outgoing” persona on me my whole life, and I didn’t realize until my late 20’s that I was super shy and an introvert. Now I honor the need for quiet as much as possible. This extends to social media- in November of 2016 I pretty much dropped off everything but Pinterest and the very unfrequent Instagram. Blogging is pretty much my jam. I started this “blog” in 1997 when I was in graduate school, but back then we called them “online journals”. I still think of it as an online journal, which you can probably tell by how long-winded I am in entries. Spiritually, I consider myself a bit of an Eclectic Buddhist. I was raised culturally Catholic (no real church-going), then went to a (horrible) fundamentalist/Evangelical Christian high school and realized that path absolutely wasn’t for me. In my 30’s, I started learning about neuroscience and mindfulness and wound up converting to Buddhism in 2016. I spent two years intensively studying and practicing Buddhism, but kept being drawn back to science and nature. So now I’m walking my own path- a lot of Dharma, but also a lot of science (neuroscience, psychology, astrophysics, and ecology…) and a little paganism (cycling with the seasons, etc.). I’m very interested in spirituality, so I actually spend quite a bit of my time every morning learning, studying, and writing as part of my own spiritual practice. I’m an avid believer and supporter of science, evolution, personal choice, LGBTQ rights, and climate change. I struggle a lot with the darker side of humanity that has emerged in the last few years. I love tea (loose black decaf tea leaves, please), books, gardening, and writing. I’m a very very picky eater. Some of this stems from my vegetarianism, some of it stems from my gastro health, and some it it stems from not wanting to invest too much mental effort into choosing foods. I’m not domestic, but I am super neat and organized. I am interested in minimalism, but more from a “let’s only keep what we love and regularly use” perspective, not a “let’s get rid of anything that doesn’t fit in a recycled mesh tote bag and move into a house the size of a tent” perspective. I love movies, but the past few years I have moved from needing to see every movie in the theater towards obsessing over binge-able TV series. TV is really great right now. I’m a really responsible person (tending towards anxiety) but I am *terrible* at responding to emails, phone calls, and texts. It’s part of my depression, to be honest. I wish this were not the case, because it makes me feel insanely guilty, but I’m trying to be easier on myself about it. A huge chunk of this journal (late 2005-mid 2006) is focused on Gracie’s adoption from Vietnam. I didn’t do much “mom blogging” after she came home because I kind of feel like her life is *her* story to tell, if and when she is ready. From time to time I mention her, but I try not to get too personal. Okay, there’s that. At least for now. 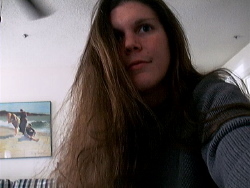 me, back when I started this whole online journaling thing in my grad school apartment, in 1997. Wow! I looked at some of your work and I love it ! Your ideas are wonderful! I’m a 18 year old hoping to become an artist sometime. I love your bright colors used in your work, I’m happy I was able to see it. hi. long ago, when the internet was new to me, ’98 i think, i found your online journal and though it was an interesting read. i dont remember exactly what happened (internet stalkers or something?) but one day you posted that you were making your journal private and i was no longer able to read it. while messing around on the computer and googling my old screen names, i found my own comment on your journal from back in the day and it led me here. i am happy to see that you are still online and to be able to see all of the interesting developments in your life. Always wonderful to look in on your life and progress. You are still an inspiration in many ways. Years ago when I had serious knee surgery I took your health struggles and love of swimming as a guide and I have since spent the last five winters as a scuba dive master in the Caribbean. As an artist I now need to follow your lead and make more art with the same passion I have for the sea. Love what you are doing girl. Thanks for sharing. We have a lot in common. I love to paint and mediate as well. I love spending time outside connecting with nature and bringing that peacefulness back to my paintings. I normally paint with acrylic paints and do a lot of whimsical pieces. What a treat to come across your website and read about your ventures. and clay. Loved the idea of painting white clay with water colors. You are so right about the colors offered for clay. I am a 71 years old, a grandmother of 4 adorable grandchildren. Love to make jewelry using wood, paper and clay. I will be back often catching up with your adventues. Chel, thank you for sharing the watercolor/ gesso idea for gelli printing. I can’t wait to try it. I’m returning to art after a couple years of illness and the loss of a loved one. I read your bio and appreciate you being open. Hearing what you have gone through gives me hope to keep on climbing this personal mountain…I’ll just paint as I go. Looking forward to viewing and reading everything you have here and trying some out. Thank you so much.